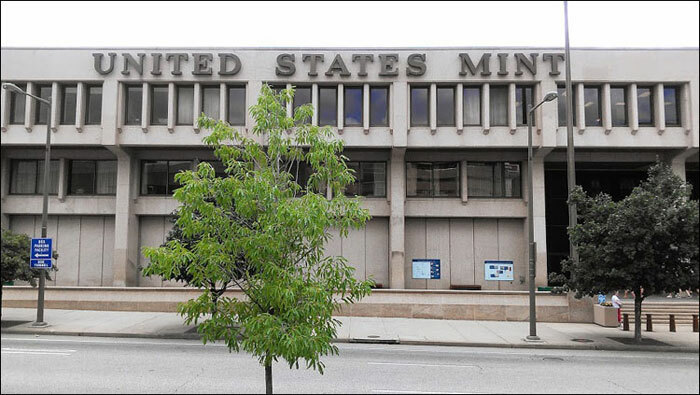 The US Mint in Philadelphia is the largest coin factory in the world. This is a summary of our experience there. I was a coin collector as a kid. That's when I first became interested in the Philly Mint. Now I'm a "silver bug." I am now even more interested in the mint because they produce American Silver Eagles. My main silver investment is in silver eagles. My wife and I arrive at the mint in the morning. It was a little awkward to get a good picture of the front of the building. I had to climb up on a brick wall across the street to get a good shot. See below. We started taking pictures right away and immediately got yelled at. "No pictures allowed" he said. Here's one of the pictures I didn't take [smile]. This is a picture of some of the US Mint factory machines. See below. They don't give tours. So we took the "Self-Guided" tour. The mint's exhibits are on the second floor. The money making machines are on the first floor. You can see the coin machines through windows on the second floor. I was somewhat disappointed that I couldn't get close to the machines. I was even more disappointed that we didn't see the coin machines in operation. It was the 4th of July... duh. ART – The striking of a coin begins with artistry and design. DIE MAKING – The die shop is where the tools that make the coins are cut, squeezed and shaped to perfection. BLANKING – In this department, round blanks are punched out of metal strips using extreme force. 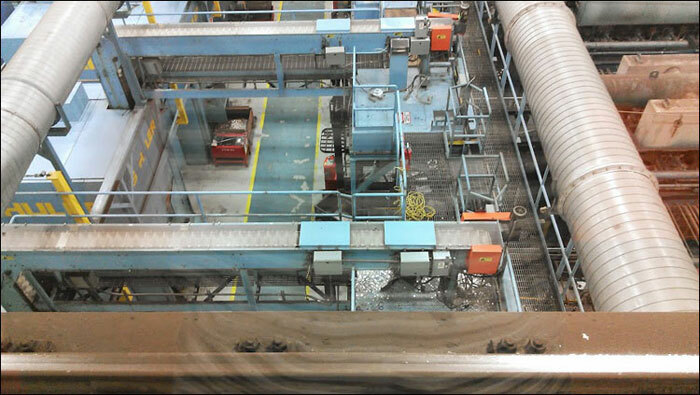 ANNEALING & UPSETTING – This is where the blanks are prepared for striking. STRIKING – Striking is where the design is added to the planchet. BAGGING – The finished coins are bagged for their journey to the Federal Reserve Banks and into your pocket! One thing I realized is that I had gotten a slanted view of the mint by some of the precious metals gurus. My view was that the mint was somehow in collusion with the US government. They would stop production at the appropriate time to create more demand and increase the price of silver eagles... In all fairness to the gurus, these things were never actually said. It was just the impression I got from listening to interviews and reading articles of somewhat paranoid people. Anyway, I realized that the US Mint is just a factory - like any other factory. People and machines working to make a profit. Strange thing to realize, but there it is. After saying all that you might laugh at the following picture. I wonder why the US Mint is displaying this sign? Hmmm... Don't get me started on another conspiracy theory, LOL. 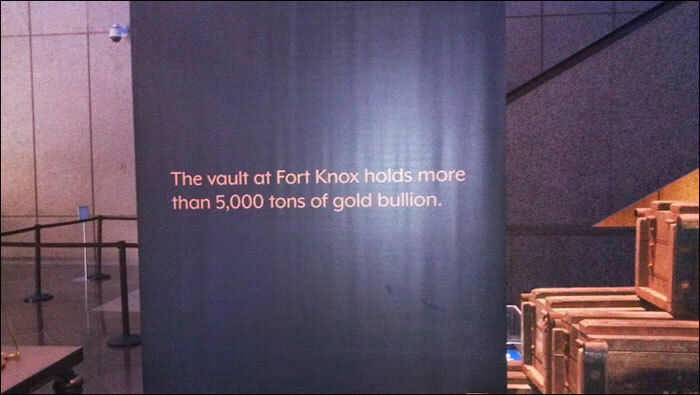 US Mint and Fort Knox Sign"
The Gift Shop is located to the right as you enter the building. It offers United States Mint coin sets, commemorative coins, numismatic collectibles, books, games and United States Mint souvenirs. I was excited about buying some silver eagles until I saw the price. An American Silver Eagle coin was about $10 over spot. It was attractive in its box with certificate of authenticity. Might make a nice gift if that's what you are looking for. There were American Gold Eagles that were about $300 over spot. This also might make a nice gift. But I was looking for deals on silver bullion. no such luck. By the way, one of the sales clerks told me that once a week they review the prices of the coins. I guess it is needed with all the volatility in the metals. Overall, I would say I was disappointed in the tour. Nice people, somewhat interesting, but I really wanted to get a close up look at the mint in full production mode. Oh well... I would say that if you go to the US Mint, go when the coin machines are running. It will be worth it then. After all, it IS free.